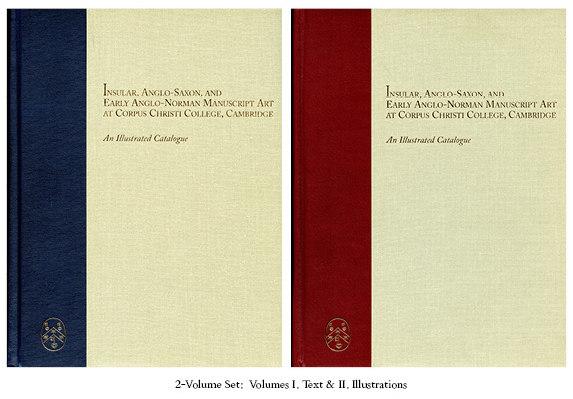 Continuing our series of interviews and reports, we explore the processes by which Mildred Budny’s 2-volume Insular, Angl0-Saxon, and Early Anglo-Norman Manuscript Art at Corpus Christi College, Cambridge: An Illustrated Catalogue (“The Catalogue” or “The Illustrated Catalogue”) was designed, laid out, and typeset to camera-ready copy for its publication as a set of 2 volumes of “Text” and “Plates”. Now we present a joint interview with the Author and the Layout Designer of “The Illustrated Catalogue”. For information about that publication see Insular, Anglo-Saxon, and Early Anglo-Norman Manuscript Art at Corpus Christi College, Cambridge: An Illustrated Catalogue. As a series of consecutive pages. In foldable booklet form suitable for printing on 11 1/2 in. × 17 in. sheets. 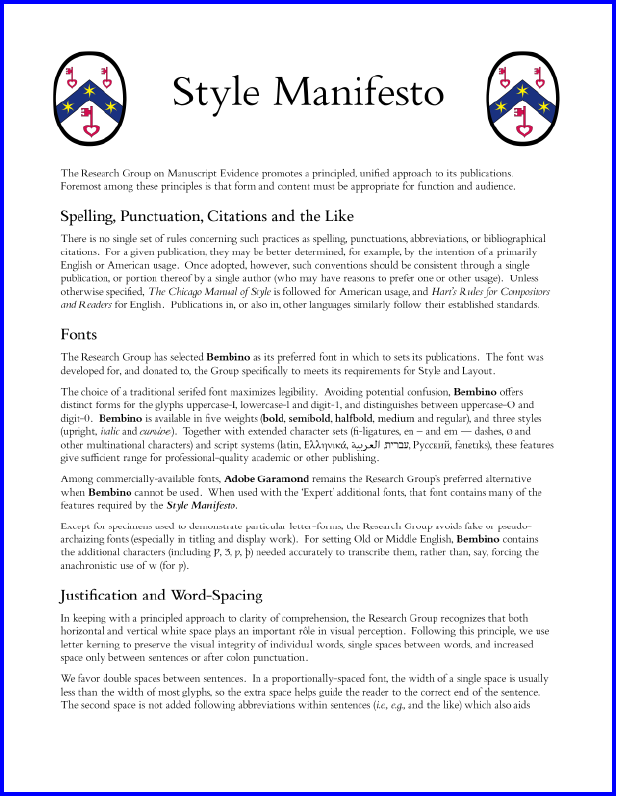 Some of the background for preparing this ground-breaking publication is described in the “Interview with our Font & Layout Designer” (published in print on 25 September 2016 and online on 6 October 2016), with illustrations, and downloadable here. For the progress and development of our Research Group Publications, please see our Publications. We invite your contributions, suggestions, and feedback. We celebrate a visit to The Library Café and its host, Thomas Hill, Art Librarian at Vassar College. That prime educational institution is the Alma Mater of the Director of the Research Groups. 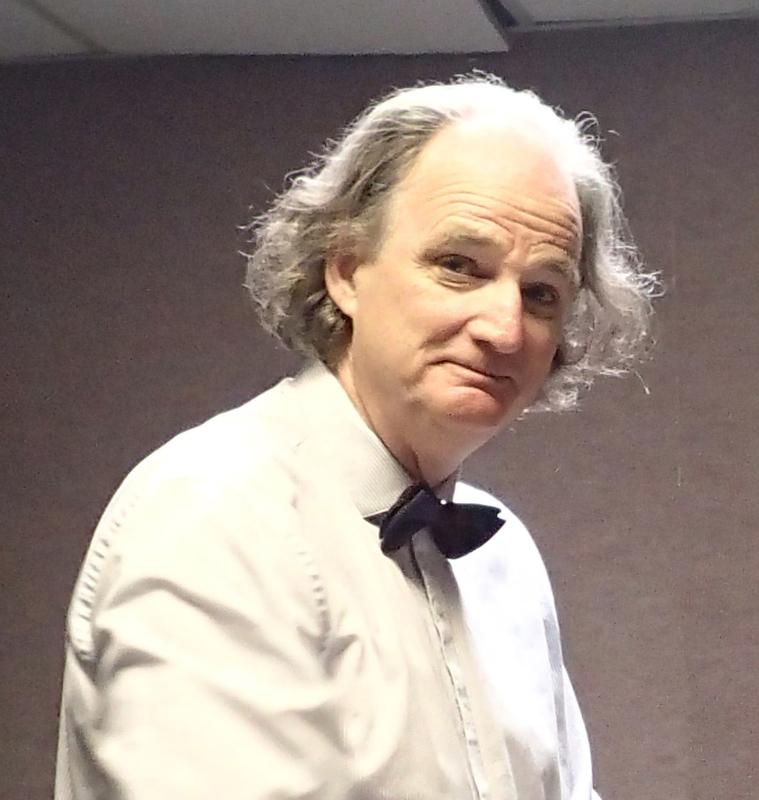 For a while now, I (this is the Director talking) have been a fan of Tom’s series of radio interviews, and a fan of Tom, with his wide interests, generous hospitality, and fascinating conversations. We first met, as I recall, at one of my talks at Vassar, and we have continued to talk, and I have continued to listen, over the years since then, at Vassar and elsewhere. The Library Café is a weekly program of table talk with scholars, artists, publishers and librarians about books, scholarship, and the formation and circulation of knowledge. As for my View? It is breathtakingly wonderful. That’s my opinion. Delighted to become part of it! 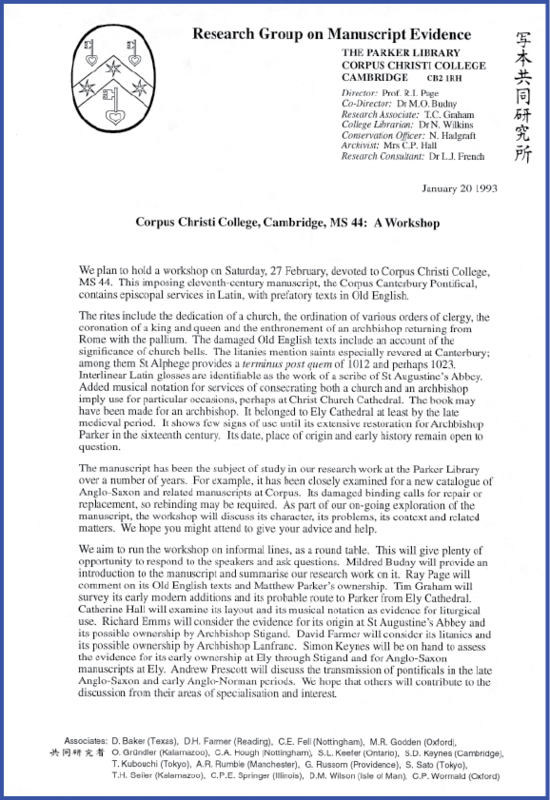 to join us for a workshop consultation concerning our MS 139, a twelfth-century composite manuscript which includes the unique medieval copy of the Historia Regum attributed to Symeon of Durham. It also has an erased ex-libris inscription of the Cistercian abbey of Sawley, although it may not have been made there. At present it is undergoing conservation and research while disbound. 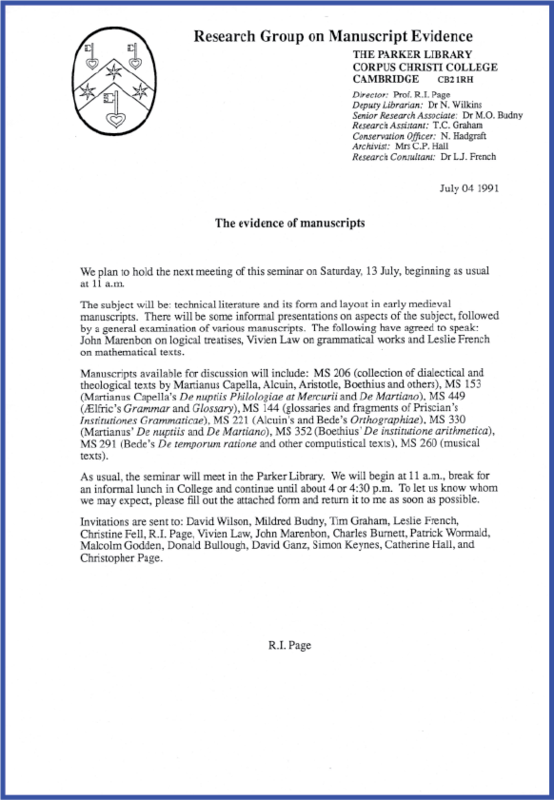 This has provided a unique opportunity for examining and comparing the different sections of the manuscript, some of which originated separately. Before it will be rebound in the autumn, we wish to discuss the evidence thus revealed with a team of specialists in various disciplines. For example, we would like to consider how the evidence modifies the existing historiography of this important manuscript. The script and decoration may help to determine the date and place of origin of the manuscript and its components more satisfactorily. The character of the texts included in the manuscript might have further implications worth exploring. We would very much value your presence in these discussions. We hope that your expert knowledge might help provide some fresh evaluations of the evidence. In this way we hope to ensure that the research on the manuscript will be of the maximum benefit for future scholarship. Ruins of the Chapel of Salley / Sawley Abbey, Lancashire. Photograph by Chris Heaton via Wikipedia Commons. Although we are unable to reimburse fares, we will provide a buffet lunch. We might also, depending upon availability, be able to supply overnight accommodation in College free of charge on the 27th or 28th, if you require it. Some participants chose to stay in College for one night or the other. Most of them attended. 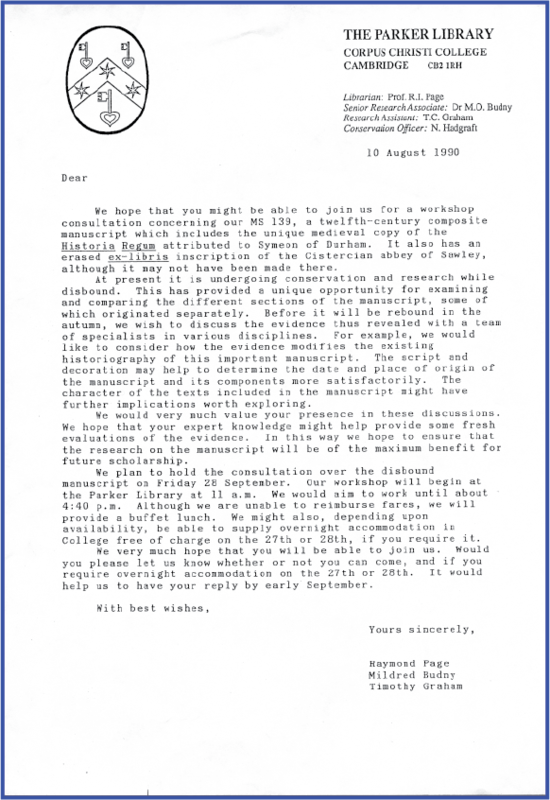 The Research Group Archives contain correspondence relating to the preparations and the follow-up of the “consultation workshop”. It is probably important to tell that a principal reason for assigning this manuscript to our Research Project was the characteristic determination of our Director/Librarian to wage polemics with his colleagues, with whatever methods and persons he had to hand. 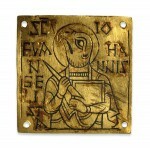 Shame that he found it appropriate to shackle people, tasks, and manuscripts to that base aim. MS 139 entered the sphere of our research work, from the very start, as we were embarking upon the integrated research of the Pilot Project, and as we designed the application for the follow-up Research Project, because R.I. Page wished to prove that one of his colleagues was wrong. He said so long and often. The issue had to do with something or other (specified, but so what, as it evolved, that wasn’t really the issue, it was the dominance, stupid, what a waste). Obedient and obliging, we responded earnestly to the directions. Set up the research, photographed the manuscript, began the integrated investigations, identified the relevant experts, invited the specialists to the workshop, and laid out the plan, with requests for advice and assistance. Wrote up the results, Tim and I. Ready to roll. Stupid, as it turned out. Fell into a trap. One hopeful scholar/editor saw an opportunity, longed for a full facsimile (we’re talking analogue, remember), plus big-time commentary, and talked us into it. Another, our Boss, continued to want the shaming of that colleague. Whatever, it was a manuscript, and manuscripts have their complexities, which we could address. We set to work. Stupid. 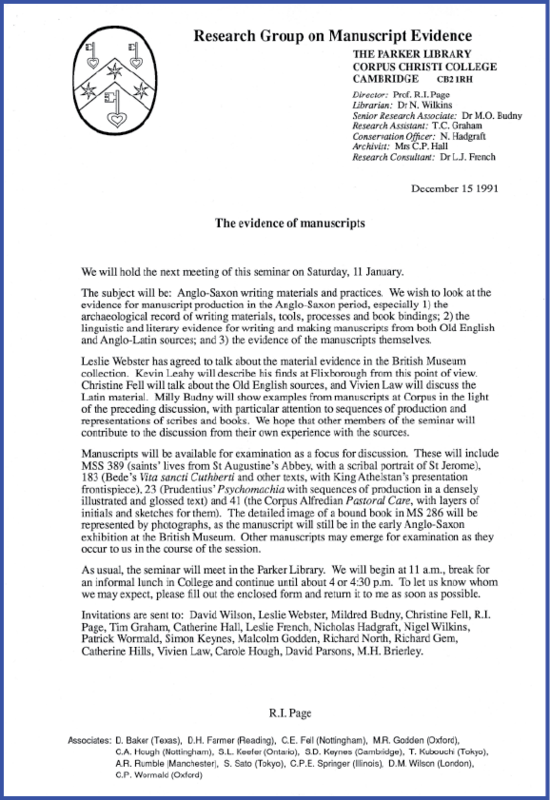 It was idiotic, as Hindsight states clear-sightedly, to assign our assembled resources (willing to photograph and to integrate research, and unfortunately being available to be exploited by all those political aims) to a manuscript of a date and genre for which our assembled expertise was inexperienced. We — that is, the Senior Research Associate (Yours Truly) and the new Research Assistant (being trained) — had to scrabble to learn about the texts, authors (or probable authors), monastic houses, scholarly controversies, individuals engaged in such studies, and all the rest. We did so, but it took time. And it deflected energy, time, and resources, from the other tasks for the Project. Soon, our Boss Got Bored. He had no experience with the work of preparing Monographs (we learned that already, alas, with the aims and efforts to produce a monograph study of the early Insular Gospel Fragment, about which another Post). 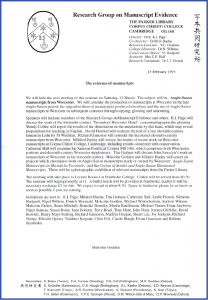 In time, through a “conspiracy” of forces, both in Cambridge and far elsewhere, reaching into the heartlands of the United States, the earnest research work on Corpus MS 139 could not find a full publication. I still lament all that wasted work. And it cost a lot, my own money included. But let us return to the Workshop in its time and place, with taking a deep breath to start that entry. The follow-up from the workshop extended into paths unexpected, as requirements, opportunities, and obstacles arose. Their processes formed part of the larger external as well as internal contexts in which the Research Project had to operate. The Memoirs might Tell All. 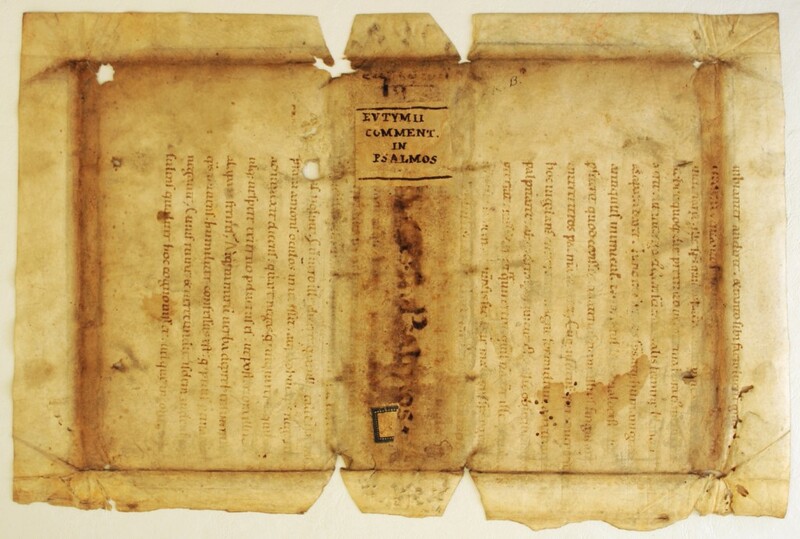 Meanwhile, let’s look at the Manuscripts and what we could learn about and through them. 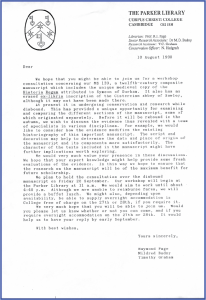 The Consultation Workshop of September 1990 and the continuing work on the manuscript by the Research Group Research Team are reported in the Annual Reports to the Leverhulme Trust, starting with the First, as the meeting took place close to the end of the first year of the Research Project (on the calendar of the academic year, revolving at 30 September / 1 October), and as the series of Seminars and Workshops had already begun before the Project began. 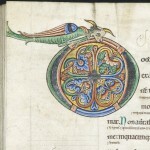 MS 139. A late twelfth-century historical miscellany with a very complex structure, including rare or unique texts, from Northern England. While it is disbound Mr Graham and Dr Budny have recorded and analysed the different sections of the manuscript and its binding history, with reference to numerous studies which have been published on it. Ms H. Humphreys, a professional draughtswoman, was employed to make technical drawings recording the sewing patterns on the leaves. We presented our preliminary conclusions at a workshop attended by outside specialists. Present were: Drs A.I. Doyle and D.W. Rollason (Durham), Dr P. McGurk (London), Dr M. Brett, Ms J. Crick, Dr S.D.Keynes and Dr J.M. Sheppard (Cambridge), Dr C. Norton (York), Dr T. Webber (Southampton) and Prof. D. Baker (North Texas). 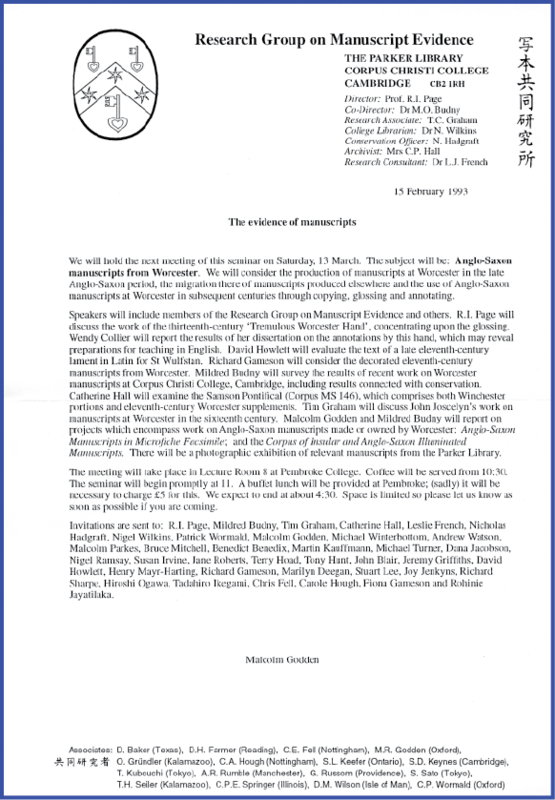 Our text forms the core of a monograph on the manuscript, to which Prof. Baker and Dr Norton will contribute. 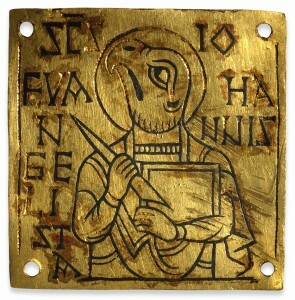 MS 139. The work on individual aspects of the manuscript is being planned for publication as a set of essays on the manuscript and its problems. Prof. Baker is preparing his contribution to the text and investigating the possibility of funding for a full facsimile, which we hope might become the first in a series of such publications. 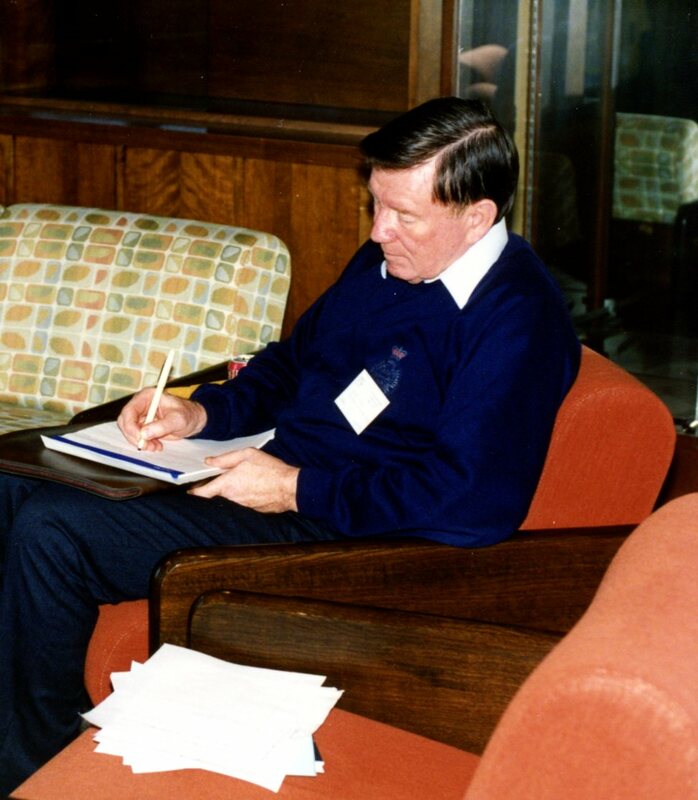 The Second Annual Report (1990–1991) continues the dual approach. The detailed study by Mr Graham and Dr Budny approaches completion. Prof. Baker is preparing his contribution to the text. His intention to investigate the possibility of funding for a full colour facsimile, reported last year, has now borne fruit, as part of our wider plans for Research Group publications. 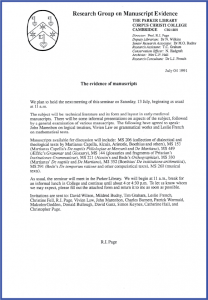 The facsimile and monograph study will appear in two volumes. Before its rebinding this year Mr Graham and Dr Budny completed the task of recording and analysing the different sections of the manuscript; identifying its numerous scribes, rubricators and annotators and the distribution of their work; and examining the evidence for its production and history. This included carrying out the photography for the full facsimile. 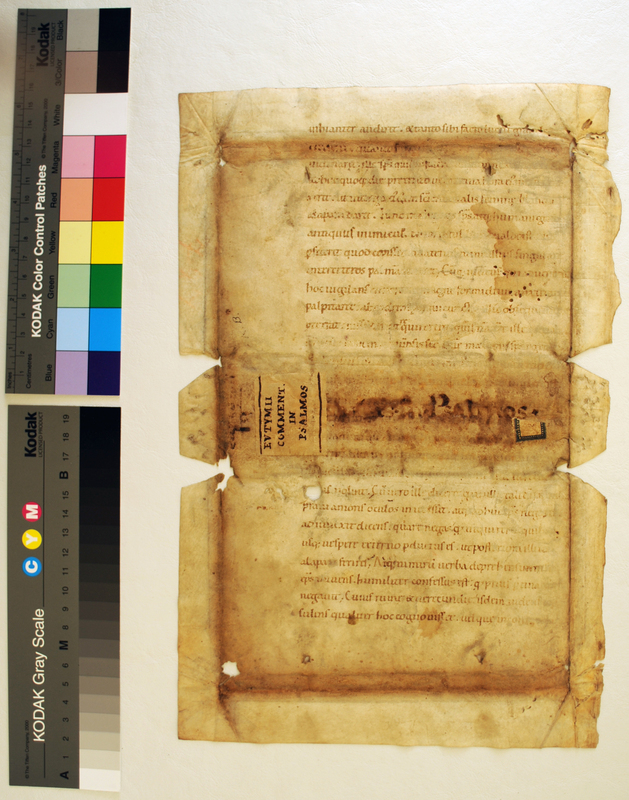 Some of the photography recorded the pages or parts of pages revealed in the last stages of conservation before rebinding began in June. The conservation work is now complete. We have continued to follow up the suggestions given by the specialists whom we targeted in the first year of our project and who have provided additional assistance since then, as well as by other specialists whom we have identified through further work. These include Drs Brett, Doyle, Meehan, Piper, P. McGurk (London), C. Norton (York) and D. Park (London). Prof. Baker continues to assist in planning the publication of the full colour facsimile of the manuscript accompanied by our monograph study. Our text is undergoing revision in the light of our further discoveries. 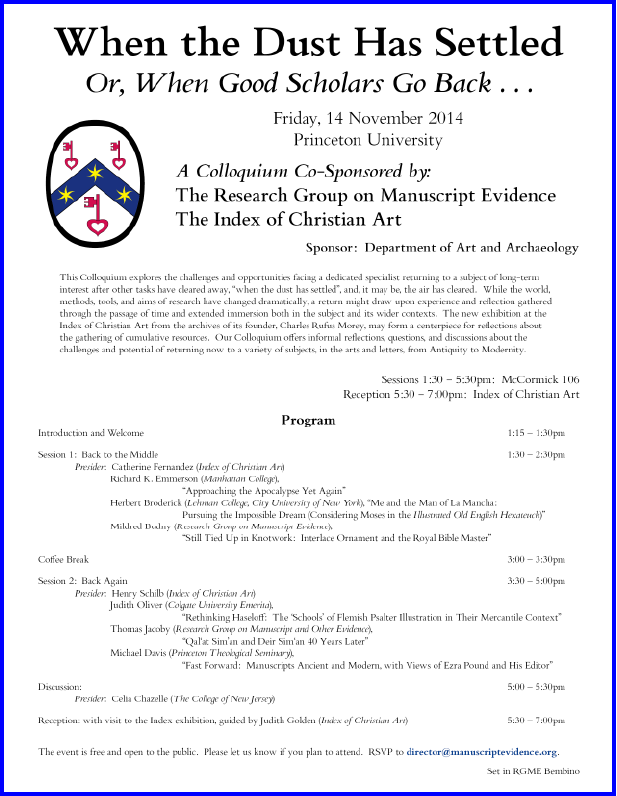 The publication will represent a major research took, as well as a landmark in manuscript facsimiles. Our planned publication is taking shape as Mildred Budny, Timothy Graham and Derek Baker, Corpus Christi College, Cambridge, MS 139: A Twelfth-Century Historical Miscellany from Northern England, to appear within the series Manuscripts in Facsimile. The facsimile and introduction are intended to form two volumes. 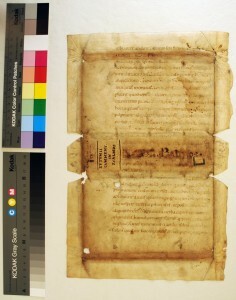 Photography for the facsimile was carried out this year, mostly in March before the manuscript was rebound; portions revealed during conservation were photographed in June. The detailed study by Mr Graham and Dr Budny approaches completion. Prof. Baker is preparing his contribution to the text. In May the Research Group helped to form Academia, a non-profit organisation now registered in the United States. The Directors are Mildred Budny, R.I. Page, Derek Baker (North Texas) and Donald Kagay (Texas). The Board of Advisers includes Prof. Godden. Academia plans to produce the in-house publications of the Research Group, the Texas Medieval Association and the Haskins Society. 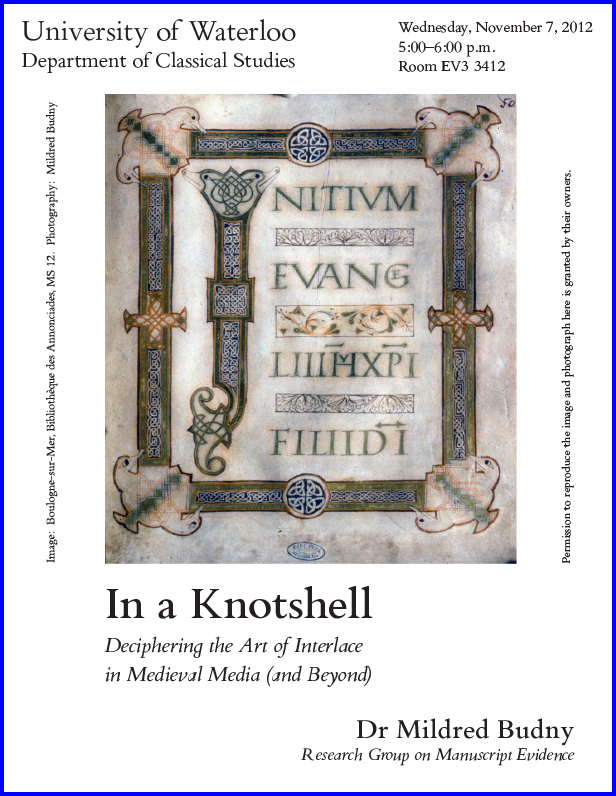 Medieval Institute Publications has agreed to distribute its publications. Dr Budny has received proposals for various publications and has commissioned works on specific subjects. In September Dr Baker visited us to consult in detail about the planned publications. By the Fourth Annual Report, it had become clear that “Prof. Baker was unable to meet his original commitments for the publication, and we no longer count on his assistance. We are now seeking an alternative route for the publication.” Sums it up. 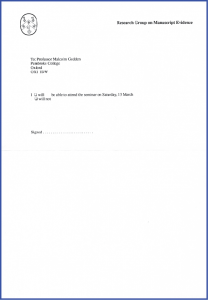 Last year the plans for such publications were reported under the heading of Academia, a non-profit organisation which the Research Group helped to form in May 1992 at the suggestion of Prof. Baker. It aimed to produce the in-house publication of the Research Group and some groups in America. Prof. Baker visited us in October to discuss these plans as well as work on MS 139. Yet the registration of Academia in America appears to be delayed, for reasons we have not been able to ascertain. Therefore, as our Research Project nears completion, the Research Group has ceased to engage in Academia and has turned directly to Medieval Institute Publications for the distribution of its in-house publications. In the final year of the Research Project, which, while wrapping up the project, continued its work on many fronts (seminars and workshops included) and experienced additional challenges in the final months. 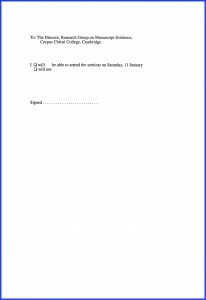 Among them was the unexpected need in the Summer of 1994 to renegotiate the contracted position which had been signed on 14 February of that year for a position in the United States, and was scheduled to commence on 1 October, but which had changed unilaterally, unexpectedly and untenably. 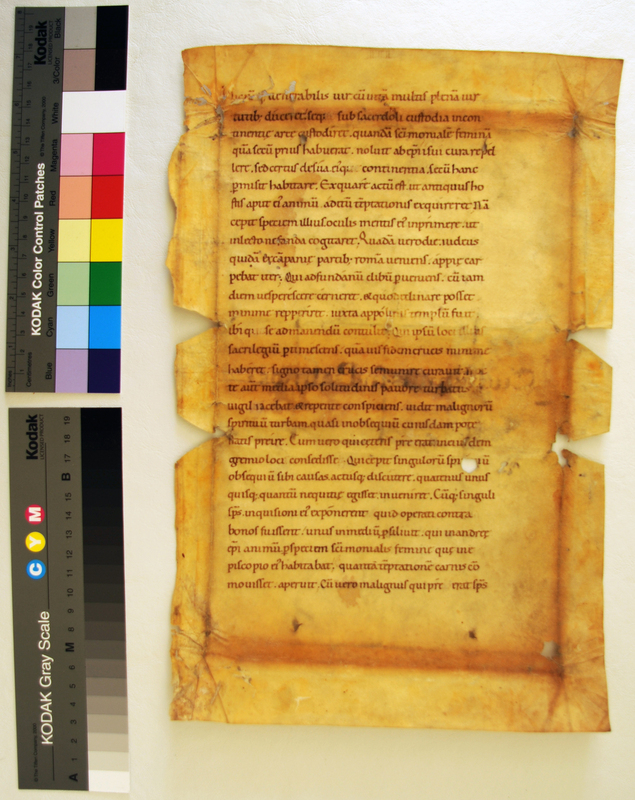 Some results of our detailed study of MS 139 while it was disbound have now been reported in Dr Budny’s paper on ‘Physical Evidence and Manuscript Conservation’. 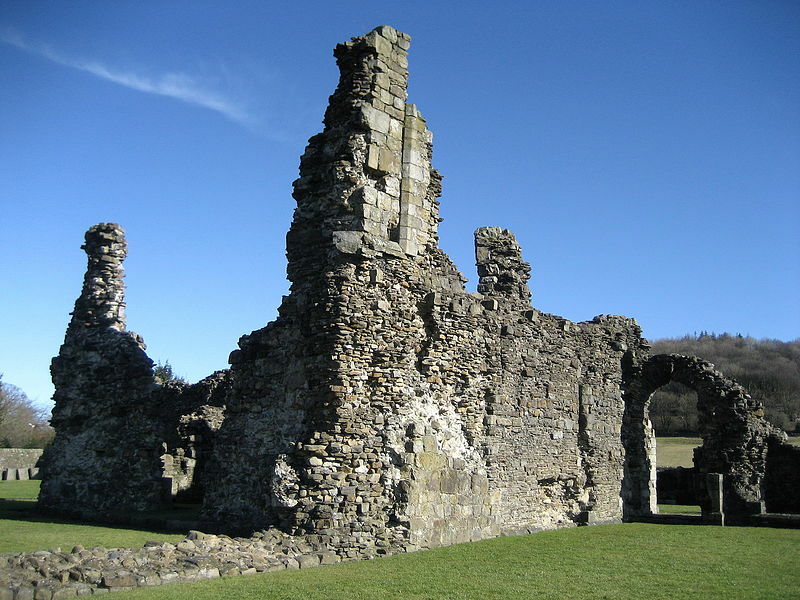 She and Mr Graham have begun to replan the publication of their fuller study, after Prof. Baker abandoned his commitments to it and the proposed facsimile, despite Dr Budny’s appeal to him at the International Congress on Medieval Studies in May. After the completion of the outside-funded project, after the move of the Research Group to the United States, as expected, but not to the expected address (see the Memoirs), and after a brief recovery from those illnesses (which returned, of course), the investor which Derek Baker had assembled for his “Academia” project held Mildred Budny accountable for the outlay for the photographic work. After all, she was the photographer, and had performed the work. Not that, after those disasters on both sides of the Atlantic, did she have any employment or savings. After all, Derek did not answer our calls. And some of the others, contributors and promised publishers or distributors included, had deserted as well. Hard going. Where were friends when we needed them? No Good Deed, Etc. (Memoirs, remember.) No wonder she fell ill for some years, for real. Running on empty has its costs. Not just money. And some things money cannot buy. No wonder, eventually, ReGrouping, we came to welcome, also, Donations in Kind. (UnKind not so much.) Good for those Donations! 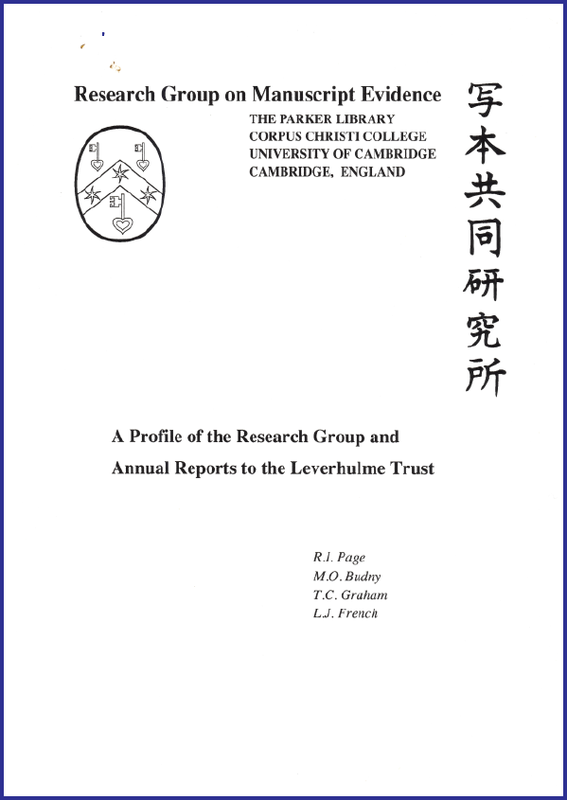 The Final Report for the Leverhulme Trust Research Project could record that, at least, “some results of our detailed study of MS 139 while it was disbound” would appear in print as part of the essay on “Physical Evidence and Manuscript Conservation” within a volume on Conservation and Preservation in Small Libraries: Proceedings of the 5th Anniversary Conference of the Parker Library Conservation Project (1994), pages 29–46, with many typos, of which some incorrect plate-numbers are remedied in the unnumbered full-page list of Errata solely for that essay. This volume publishes the updated proceedings of “The Parker Library Conservation Project, Corpus Christi College, Cambridge, 5th Anniversary Conference on Conservation and Preservation in Small Libraries”, held at Corpus Christi College in September 1988. The completed paper includes black-and-white photographs of MS 139 (and other manuscripts) taken before or during their conservation, along with Helen Humphrey’s technical drawings of the exposed sewing patterns of MS 139 before the rebinding and reconstructed views of the former binding, with its clasping mechanism. That publication’s report was an effort to show something of the labors’ results, even if in a compacted and somewhat out-of-the-way publication. This, too, was the sort of network of expertise and personal connection which came, as if a Dowry, with the arrival of the designated Senior Research Associateship, all outside-funded, at the Parker Library in the autumn of 1987. Some marriages — even arranged marriages — may be, or become, happy. Some households may welcome, or come to welcome, their Brides. 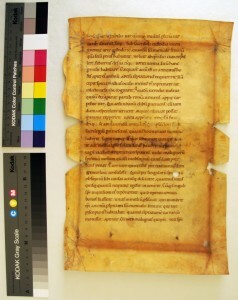 Advances in techniques of both examining and conserving manuscripts call increasingly for the careful assessment and preservation of their physical features as very much as possible. Usually regarded as standing outside textual, historical and art-historical spheres, many such features have frequently been ignored, dismissed or destroyed outright. They can. however, when properly observed, deciphered and set in context, yield considerable information — sometimes surviving in no other forms — regarding the nature, origin and history of the manuscripts themselves, and often also of related manuscripts and works in other media. 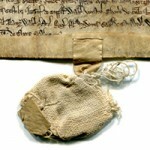 When taken hand in hand, scholarly knowledge of and research on the manuscripts can greatly aid the sensitive conservation, just as conservation can contribute immeasurably to scholarly understanding of the books, not only through the evidence which emerges into view during disbinding, but also through collaborative interchange between scholars and practitioners. Another time, we aim to present some more of those findings. We start with a tidbit. 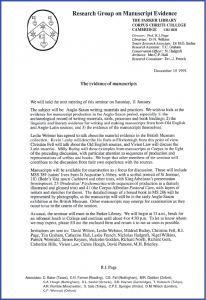 We prepare to publish, in a more accessible venue, some bits of the information which that essay endeavoured to present, absent a monograph study and facsimile of the manuscript. The compressed information presented in the 1995 essay seemed the best, in a cloudy, mostly abandoned state, that might be done. That study/monograph/facsimile turned out to be one of the very many casualties which fell prey to the problems besetting the Research Project in its full set of years. 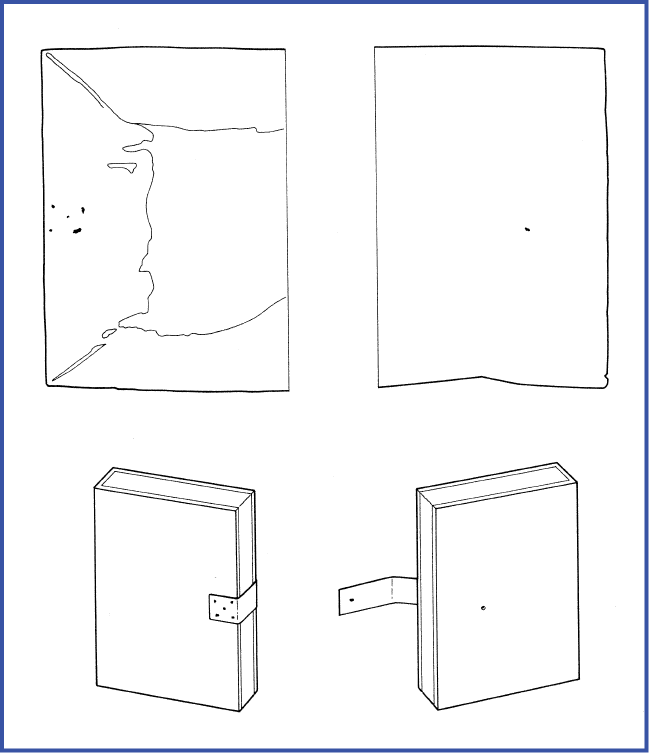 Technical drawings by Helen Humphreys, guided by Mildred Budny, while the manuscript was disbound. Soon we will present the Quire Diagrams, and more. Better late than never, it may be. You could also review the full Series. It was a wonderful ride! So many colleagues and friends responded to its call, and so many manuscripts opened their pages, with permission, for the chance to look, consider, admire, and converse! Aren’t they wonderful? Don’t they talk a lot, when we pause to listen? Fun when they talk back. 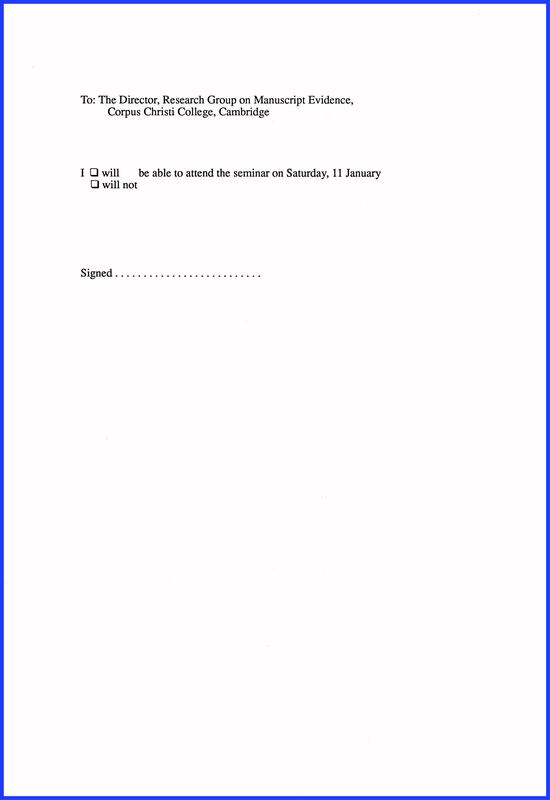 2-page Invitation in pdf, with 1-page RSVP Form. in Japan in November and December 1992. 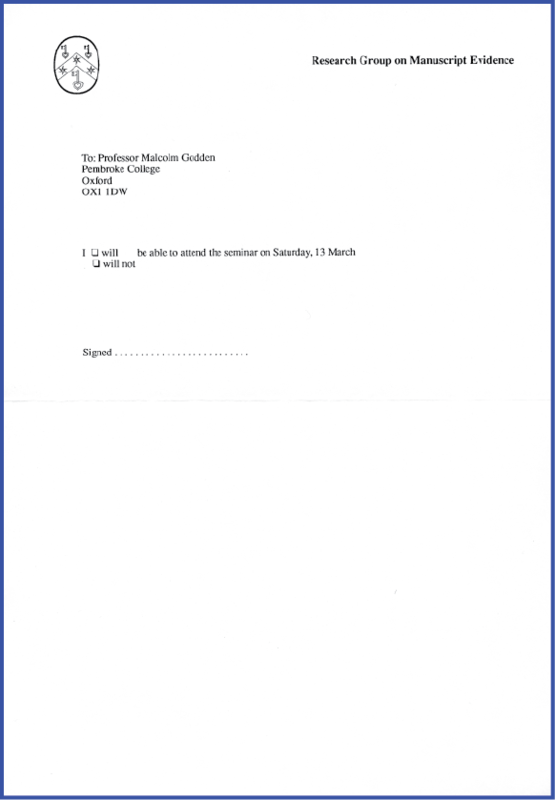 Dated 20 January 1993, the 2-page Invitation Letter (shown here and downloadable here with the 1-page RSVP Form) provides the Menu for the Food for Thought. 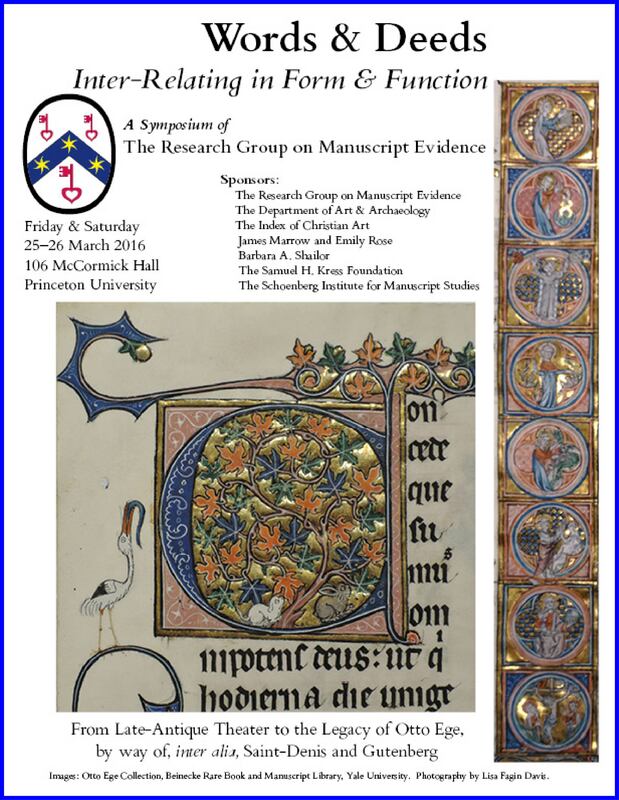 This was the second of the three Seminars in the Series on “The Evidence of Manuscripts” to be held at the University of Oxford and hosted by our Associate, Professor Malcolm R. Godden. This was the second also to be held at his College, whereas the third took place in the English Faculty. This meeting cast the spotlight upon a single volume — albeit a complicated and multi-partite volume, comprising an assembly of 3 Parts from different former manuscripts. A Triple Decker, with lots of trimmings. Once upon a time, the margins of the book were included in the trimming process, alas. We had a close look as experts gathered from several centres, even by proxy. 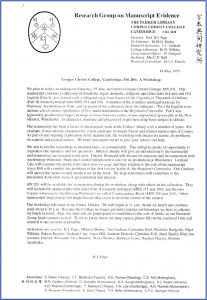 From the moment of the First Seminar in the Series, devoted to “Manuscript Illustrations as Evidence for Anglo-Saxon Life”, and taking inspiration from it, the subject for this Seminar emerged naturally, early in the Series, as part of a Research Project at the Parker Library designed to examine “The Archaeology of Anglo-Saxon Manuscripts” and to integrate expertise in a variety of disciplines. The Brandon Plaque. © Trustees of the British Museum. The design of the Project flowed, in no small part, from the work for a Ph.D. dissertation (University of London, 1985) which focused on an integrated study of Anglo-Saxon manuscripts and was supervised by an archaeologist, David M. Wilson, the Director of the British Museum and author of the catalogue of Ornamental Anglo-Saxon Metalwork, 700–1100, in the British Museum (1964). That authoritative catalogue contains some of the materials considered at the Seminar. 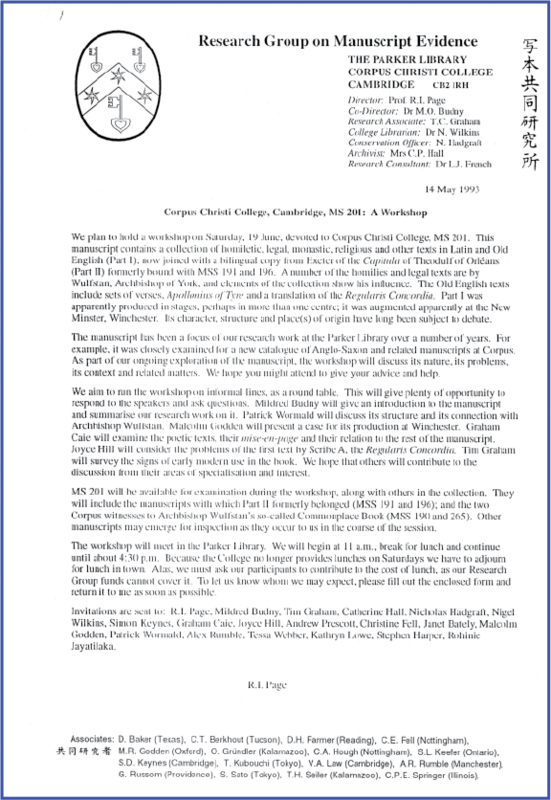 For the Seminar, the 1-page Invitation Letter (shown here and downloadable here, with the RSVP Form), dated 15 December 1991, lays down the cloth for the repast. 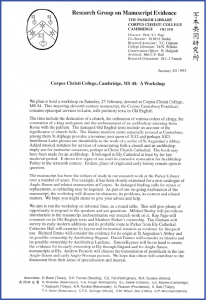 We will hold the next meeting of this seminar on Saturday, 11 January. 3) the evidence of the manuscripts themselves.